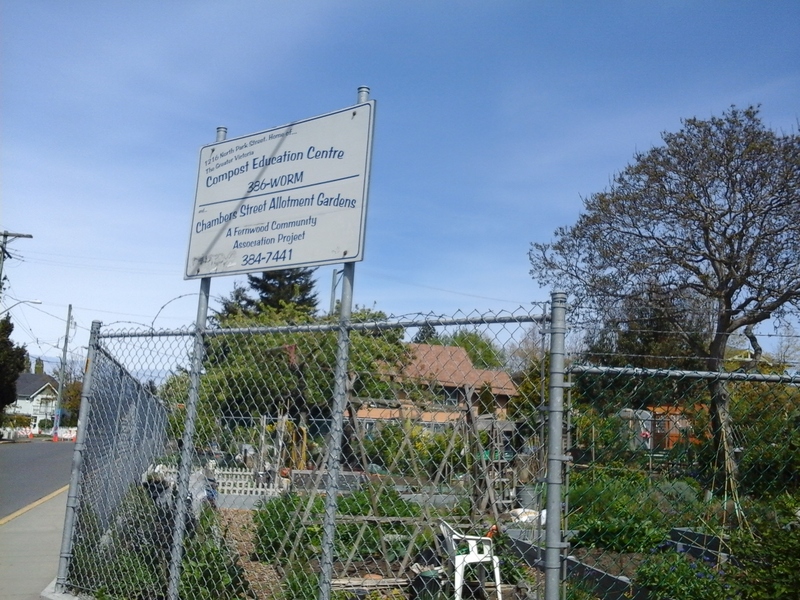 As one of three allotment gardens in the Fernwood Community, the Fernwood Community Garden, also know as the Chamber Street Gardens, hosts raised garden beds that are divided into thirty-four plots. The gardens produce amazing produce (just had to write that). Perhaps this is why the area is surrounded by a chain-link fence with barbed wire across the top and secured gate. The Victoria Compost Center (www.compost.bc.ca) also operates from this garden. The fence is partially bordered by snowberry bushes. Fernwood Community Garden be reached from the Trans Canada Highway. Continue along the highway as it becomes Douglas Street. Turn east onto Bay Street and turn right onto Chambers Road. These gardens border on Chambers between Vining and North Park streets. There is limited roadside parking. The city bus travels along Fernwood Road from downtown.